Rio’s UniSpey line is a relatively new design especially targeted at general purpose Spey casting and fishing. In a lot of respects this is kind of the equivalent of the Rio ‘Trout’ or SA ‘GPX’ line: it’s meant as an all-around go-to with a couple of features targeted at anglers who may not necessarily be experts at the art of Spey casting (which would include me). Most notably, the back taper of this pale gray/tan line is a dark grayish black color. This is the “power section” which should be in the tip top guide to execute proper Spey casts. Too far forward (in the fat tan part) and you won’t have enough line on the water to avoid blowing your anchor. Too far back and you’ll be in the running line proper, without the ability to transfer energy into the head and form up a loop. If you study it carefully you’ll note that the dark ‘power section’ coloration actually extends onto the running line for a short stretch. That’s meant to give you a visual marker of the amount of overhang you may want in order to make a distance cast. With any form of shooting head, and this WF line is a modified shooting head, total distance is a function of how much overhang the angler can handle out of the tip top before releasing the “ball and chain”. 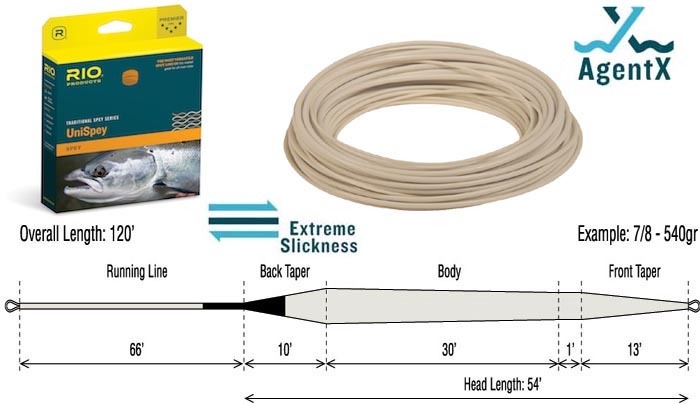 For max distance with this line you would need to be able to carry the head (by forming up a D-loop, using whichever Spey cast you choose to do that), on the very back of the dark section. That will maximize overhang and can result in big casts of more than 100′. I played with this line on a new-to-me Scott G series 13′ 8 weight and really loved it. 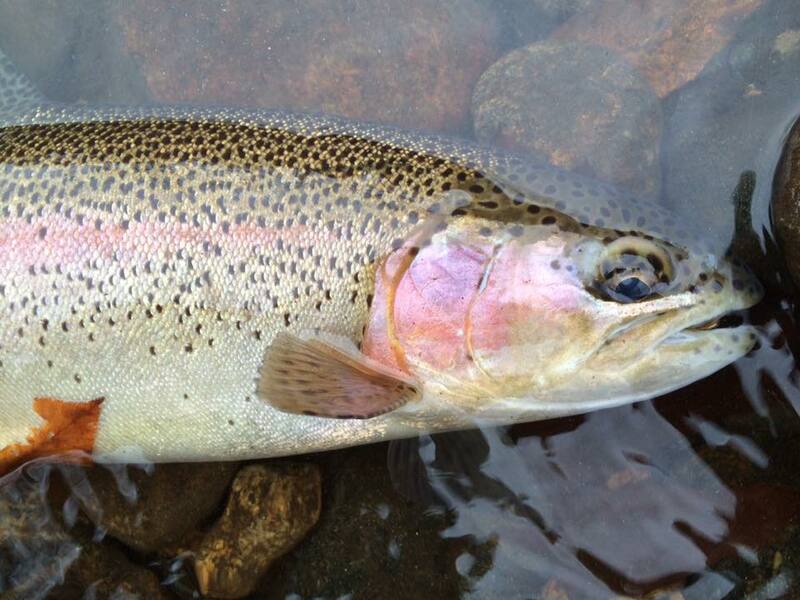 I caught a nice fat trout on my very first cast with the setup, which frankly does tend to give matters a rosy hue. Later I set up a few distance shots. Rusty as I am with the Spey rod, this is a line that even in a mediocre Spey caster’s hands will easily get you 100′ or more (which, contrary to a lot of people’s belief about Spey fishing, is a lot more than you usually need to catch fish on the longest rod). Overall great product and strongly recommended for those looking for an all-around option to learn true Spey casts instead of chuck and duck Skagit technique.